Be stronger than your strongest excuse! 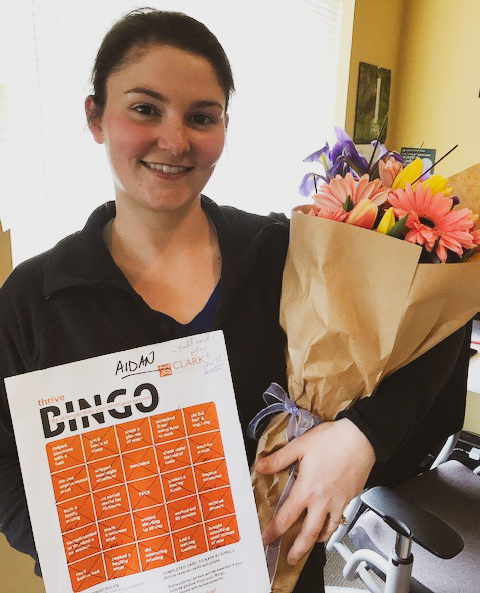 Promoting health and wellness was the goal of our recent “Thrive Bingo Challenge,” in which Clark employees earned points and prizes for making fun, positive choices at work and home. “Helped someone with a task” … “Worked out 60 minutes” … “Complimented or thanked a coworker” … “Made a wellness appointment” … “Skipped dessert” … by meeting these and 20 other challenges (“No social media for 48 hours,” yikes! ), our team members took a holistic, intentional approach to their day to day lives. Congratulations to Aidan Sievertson, who not only completed all 25 challenges on the card, but earned extra credit for including photographs to document her adventures along the way. Well done, Aidan! Second place (also with a full card) goes to Marty Sievertson, with third place to Carol Nakhuda, who completed all but one challenge. Honorable Mentions go to Adrienne Crowley and Rob Godschall. Thank you all for being valued team members, and showing by example that Clark Construction is a great (and healthy) place to work.